This is the first year I’m personally honoring Kwanzaa in my household. In years past, I was invited to a friend or neighbor’s celebration. Our household’s first year of recognizing Kwanzaa will be a simple act. Seven candles, representing Nguzo Saba, or principles–Umoja, Kujichagulia, Ujima, Ujamaa, Nia, Kuumba and Imani–will line our table. If time permits, I will make a special meal to further discuss and think about the daily principle. A thoughtful holiday requiring no fancy gifts and decorations, Kwanzaa’s timing is quite appropriate after weeks of extravagant giving. It’s a joyful period of reflective thought about our cultural past, present and future in the coming new year. Within the occasion, we think about our community, friends, family, and ourselves. Basically, it’s a time to think about what is truly important in life. To reflect on remembering we are not alone in the universe further enhances the quality of life. We are all part of the African Diaspora. We are a community of people representing diverse cultures, languages, religions and thoughts. 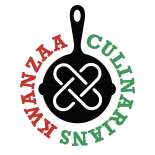 Celebrating our rich diversity, KwanzaaCulinarians.com is about people with a passion for food reflecting on Nguza Saba. We’re food bloggers, activists, chefs, caterers, farmers, publishers, and more. Like most joyous occasions, food is our connector. When we approached food bloggers to participate, many said they didn’t celebrate it. However, they were curious about it. People, who are passionate about food, don’t need much motivation to participate in a new endeavor. Food is a complex topic, and few people can truly discuss all its intricacies. Despite food being a never-ending wealth of information, it doesn’t stop people from learning about it. It was Bren Herrera of Flanboyanteats.com, who recommended using “culinarians” in our Kwanzaa food group’s name. Initially, it was an intimidating name, because it suggested we know all about food. Compared to the average person, we do know a lot about food, but don’t know it all. We simply love to learn about it. It makes sense, for curious minds would want to participate in Kwanzaa. It expands their knowledge about food while learning about our cultural heritage. Within our cultural community, food connects us to many complex issues of today. Increasing obesity, high blood pressure and additional health problems caused by poor diets and lack of movement. Food deserts located around the United States disabling communities to have access to healthy alternatives. The media influence how communities think about food. The average young person’s inability to name a tomato and to think pizza is a vegetable. Decreasing numbers of African-American farmers. Rural, farmlands are being converted into large prison systems. Such issues cause many people to demand better food systems. Within the principles of Kwanzaa, is a foundation to addressing poor food systems, for it starts with believing in the community, family and us. From December 1st to December 25th, food-related influencers are contributing content about their cause, service or it could be a story from their heart. We’ve partnered with Oldways who recently introduced The African Heritage Diet Pyramid. Janelle Carter of CorkChronicles.com writes about African-American owned wineries. Cookbook author, Bryant Terry discusses his inspiration for being a vegetarian chef and food activist. On the first day of Kwanzaa, the first four of 28 food bloggers will publish their stories and recipes reflective of Umoja. For the next six days, this process continues with each group representing the daily principle. In promoting and supporting KwanzaaCulinarians.com, we ask everyone to update their social media profiles with the name of their favorite ingredient from the glossary of African Heritage ingredients (courtesy of Oldwayspt.org). Next to your favorite ingredient, post one of the seven principles you aspire to reflect about this month and into the New Year. Whether you’re a newbie or a guru about Kwanzaa, visit us everyday to learn about individuals, organizations, and businesses within the food movement. We’re all Kwanzaa Culinarians. It’s not the idea that we know everything about food. It’s the process of learning and growing in the world of food as we inspire each other within the defining principles of Kwanzaa. This entry was posted on November 29, 2011 by Kwanzaa Culinarians in 2011, Imani, Kujichagulia, Kuumba, Nia, Personal Story, Ujamaa, Ujima, Umoja and tagged Habari Gani, MyLifeRunsOnFood.com, personal, Sanura Weathers.